Laura and I are usually responsible for the Thanksgiving feast - others handle Christmas and Christmas Eve dinners. Like the past few years we stayed pretty traditional - turkey, potatoes, cranberry sauce, etc. No recipes on this post but if anyone is interested I can add later. They're basically slightly altered versions of recipes from sources like Martha Stewart, Giada DeLaurentis, Ina Garten and others whose books and videos I've learned lots from, and they all came out very good. It was a lot of work but nothing I minded doing, in fact I get a big kick out of handling these big dinners. First up was the ice cream. A couple of days ahead of time I made a basic custard and steeped a split vanilla bean in it while it cooled. Usually I'll strain the flavoring but thought it would be nice to leave the bits in the cream this time. Added a little visual hint that the flavor came from a bean and not from extract. I chilled the custard overnight and put it into the ice cream maker to turn for about a half hour. Once firmed I put it in the freezer for another night to freeze up for the dinner's dessert which also included a pear-apple-cranberry crisp. As I've done the past two years, I brined the turkey overnight in a flavored salt, wine, water solution in a brining bag left in the cooler with ice at a constant 40 degrees. I pulled it out about an hour and a half prior to putting it in the oven and washed it thoroughly patting it dry to warm up a bit. The past couple of years I hadn't much luck with cooking the stuffing in the bird so decided to just bake it separately. I got a great idea from somewhere to fill the turkey with fruits and herbs instead. I got three small lemons from our tree, cut up an apple, and added some thyme twigs, a branch of oregano, and several juniper berries, along with a generous sprinkling of salt and fresh cracked black pepper. I then sewed the cavity shut with a paper clip running butcher twine on the edges, pulled the wings up under the body and tied the legs together to get everything into one package. I draped a cheesecloth soaked in butter and riesling to cover the bird for the first half of the cooking - about 30 minutes at 450, the next hour at 350, removed the cheesecloth to cook for another hour and a half at which point the internal temperature was roughly 165-170. I turned off the heat, tented foil around the bird to rest in the warm oven for about an hour. Cranberry sauce was a simple concoction of dried cranberries with sliced onions, orange zest, seasoned with curry, mace and sugar. The stuffing was a base of Italian sausage, onion, butter and sage mixed with a whole loaf of Acme whole wheat with the crusts removed and chicken broth and cooked at 350 for about 30-40 minutes. A simple Brussels sprouts dish sauteed in olive oil, crushed garlic and bacon bits, with chicken broth to moisten. 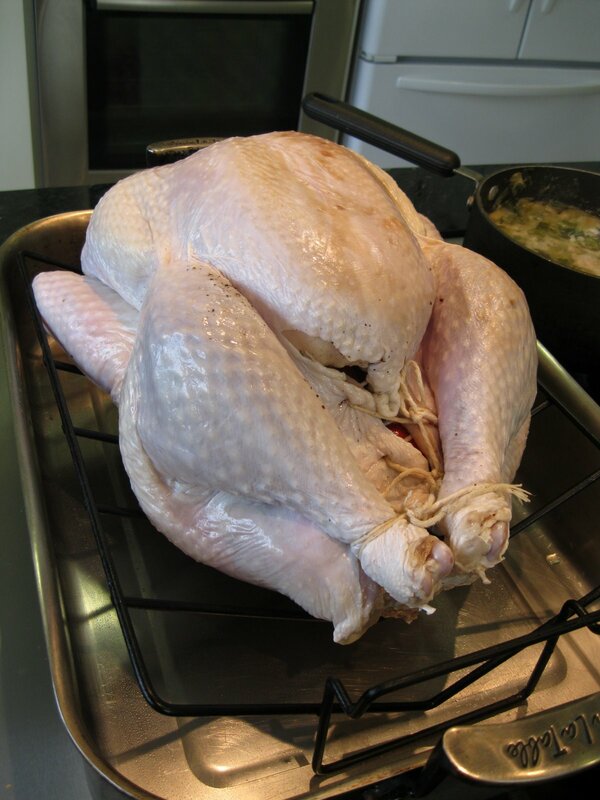 Here's the cooked turkey prior to opening and carving. I had made a broth from the turkey gizzards, heart and lungs with onions, celery and leek. I used this for gravy by preparing a small slurry with a bit of the broth, the drippings stuck in the pan from the turkey loosened with some Madeira wine and the remainder of the broth. I de-fattened the drippings liquid and added them at the end. It was all reduced and seasoned with some salt and pepper prior to serving. Plate served with one of the legs, sprouts, stuffing, roasted potatoes/garlic, and cranberry. This was the pear, apple, cranberry crisp. I had spent a few hours early in the week to make what seemed to be an interesting take on an apple and cranberry pie that resulted in a complete disaster but was rescued by this really nice and fairly easy-to-prepare crisp from an online Ina Garten recipe. Mucho gracias to her for it! And it went perfectly with the ice cream, which was where it all started.